Have you ever been to Buckingham Palace? Or even the White House? What is one of the first things you see? Things need to be locked down and secured to operate. This specifically applies to your website security! Securing your website to make it safe for consumers to navigate should be on the top priority list for your business. So, let’s talk about some distinct ways to ensure website security. There are many ways to implement website security from the ground up. Everything from registering your domain to the complete design, coding, and publishing process. 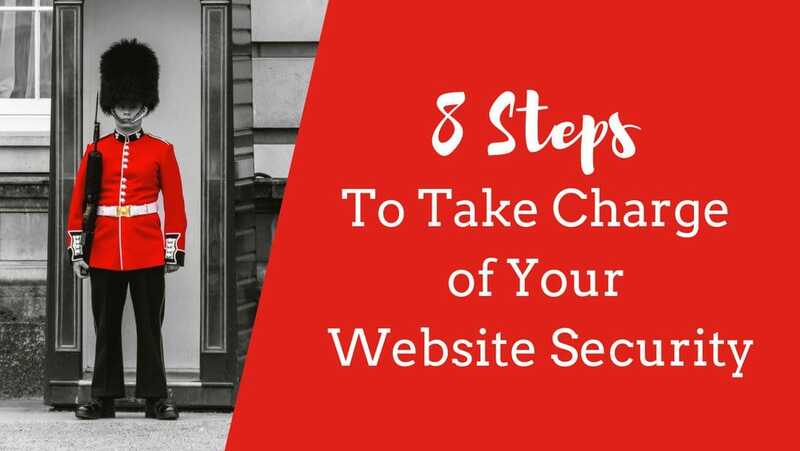 There is more to each process, but these steps should get you going on the right path to official website security. Website security starts with registering your domain with a reputable registrar. It is the place people visit to find your home. Many registrars, like GoDaddy, HostGator, and SiteGround, offer Domain privacy. Domain privacy isn’t something you are required to purchase, but using domain privacy has a lot to offer you as a website owner. You will thank yourself by utilizing domain privacy, and the cost is small compared to the risk of not having your information private. Domain privacy starts with your domain name and an organization called WHOIS. WHOIS is a global database of registered domains. This database is open and public to everyone who wants to view it online including hackers, spammers and more! It’s simple, with domain privacy, you avoid all of that as your info is shielded and not seen. Easy enough! Your web host is your actual home. The web host you choose is the actual place where your house (business) sits…online. Many reputable web hosts provide security through their servers that offer better protection for your website data. Make sure you verify that your web host can provide Secure File Transfer Protocol (SFTP). This contributes to your website security by ensuring safety when uploading your files. Check to see if your host has a file backup plan and keeps up with all security updates. Most importantly, make sure the web host you choose provides the most up to date server software. In the past, an SSL certificate was required only if you had an online store or were doing any transaction online. However, now, it is not only encouraged by everyone, but Google enforces it. By the end of 2017, Google kicked the security recognition into high gear. In Google’s eyes, if your website doesn’t have an SSL Certificate, they will not hesitate to put a red flag on your site! This tells the customer your site has the possibility to not be safe. Trust me. You don’t want that! Take the necessary steps to implement the SSL Certificate on your website to attract and keep customers coming back. These days there are many great CMS options to choose from that help with your website security. CMS Programs such as WordPress, Drupal, ExpressionEngine, Radiant CMS, and Cushy CMS are just a few top choices. Whether you are creating your website yourself or working with an agency, make sure the CMS platform you choose includes tons of support. Meaning it’s a trusted platform that continues to update their software and is not going anywhere anytime soon. Checking for CMS updates should be done DAILY! Don’t miss them! Take every step you need to make sure you and your CMS are up to date on website security plug-ins or add-ons. Hackers are smooth and always looking for a way in. And once they find it, they can create a whole lot of damage in less than a day or even hours! Make sure to stay on top of all updates and security patch issues to keep your site secure. If you understand the importance of updating your site, but you don’t have the time to stay on top of it all, book a consult with your web designer or agency and consider a monthly website maintenance packages. Take the stress right out of it! As you begin to build your website, keep security in mind from the get-go. Think deeply about how your site will flow and how it will look. Is it straightforward and simple? Is the text clear? Are you being transparent with your visitors and communicating with them what information you’re gathering from your site? With your CMS choice, you should be able to hit the ground running and include add-ons and plug-ins that are recommended for optimal website security. Most importantly, make sure that all security regulations and rules that apply on the web like GDPR compliance are being met. A firewall is a serious tool to consider for website security. The minute your website is live, it is open game for cyber threats. Hackers work tirelessly with bots crawling throughout the web looking for websites that are not secure. Hackers see new websites as prime targets so implementing a firewall is crucial to protecting you and your customers. There are many good firewalls to choose from. Systems such as Cyber roam, Barracuda Networks and Sonic Wall to name a few are amazing firewall systems that contribute to website security. Have a meeting with your IT department or even your web designer for a consultation to consider the best protocols and recommendations. Having a website is fun and a significant accomplishment for your business. However, after the site is published many business owners fail to grasp the idea of maintaining their website. The responsibility of keeping your website secure starts from day one. Your main job is to keep you and your visitors safe and make sure your site is not a target for security threats. If you as a business owner don’t have the time to commit to that responsibility, train someone on your team to do it, or hire an agency to take care of it for you. Have you ever been provided with passwords from your design agency or IT department that look like gibberish to you? It might be something like @u08ygkj!3j0dp]. You get them, and you think to yourself, “I’m never going to remember that!” and you proceed to change it to something “easy” and “convenient” for you like Cookielover21. That is a big no-no! Your team created those passwords for a reason. They are not trying to make your life harder or challenge your memory. Passwords need to be strong and hard to crack. Take the time to learn the password, or keep the password somewhere safe where you can copy and paste, but do not modify them for your convenience because, in the long run, it could cost you a fortune! Always keep your passwords super strong on your database, FTP transfer systems, and all logins. Make sure your passwords are powerful, 12-16 characters and always mix and match upper and lower case with special characters to keep hackers from being able to get in. And don’t use the same password for everything! Keep your own computer safe! Don’t forget; hackers can get into your computer and find your password information to move into your website and damage you beyond repair! Install antivirus and anti-spyware software and make sure you configure your browser’s security and privacy settings as well. Do what you have to do to protect yourself from viruses and anything else that can open the door to virtual attacks! Protect your business reputation by maintaining responsible cybersecurity systems. To learn more about solid customized website security strategies that can help you improve your new website’s reputation, call us at 832-408-7439 or fill out our form to get a free consultation.